Xanthomonas wilt of banana (BXW) is a serious bacterial disease that affects many farmers across Burundi. Outbreaks of the disease appear as localized ‘hotspots’, spreading rapidly to nearby farms by way of flying insects and contaminated farming tools. Banana plants wilt and the fruit becomes inedible. If nothing is done, BXW can cause the total loss a household’s banana harvest. An effective BXW management strategy called ‘complete mat uprooting’ has been widely disseminated to farmers, but adoption has been poor. Why? CMU is highly labour intensive, and farmers will lose a significant amount of their productivity. 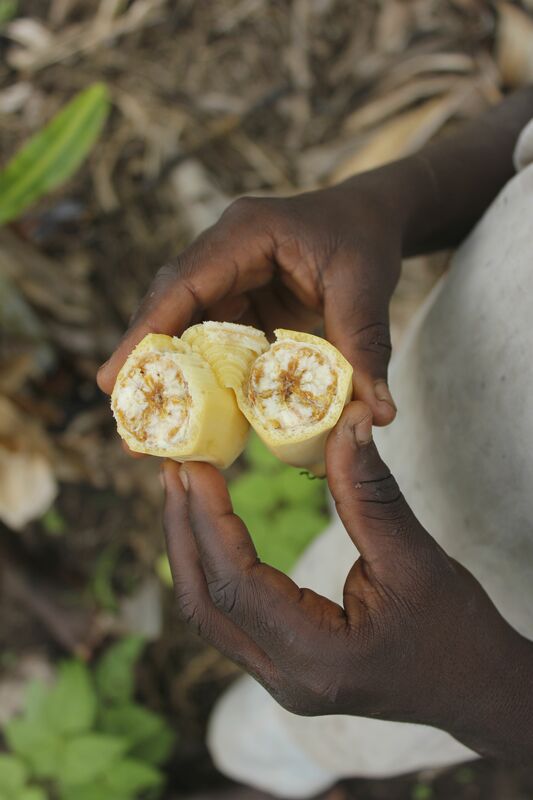 We know that the eradication of BXW in Burundi is virtually impossible, but also that infected bananas display a unique property allowing farmers to control the disease effectively and for relatively little effort. This characteristic is the basis of a new technology called ‘Single Diseased Stem Removal’ that is ready to be disseminated to farmers at scale. A Burundian farmer showing fruit lost to BXW. The banana shows brown discoloration and becomes inedible. Burundi has one of the highest levels of banana consumption in the world. Most farmers grow banana for food or for sale. The ‘Broadening the Scaling of BXW Management’ project leverages existing cooperation with the national agricultural extension agency, CRS and local organisation Reseau Burundi 2000+. Bioversity and partners will train and follow up with nearly 20,000 BXW-affected households in Muyinga Province, north-east Burundi. We expect a much higher rate of adoption on SDSR than with CMU. And the impact? A typical Burundian household with half a hectare of bananas, of which 10% of the bananas affected with BXW can expect a recovered productivity of at least 250kg per year valued at USD75. More grow more food and have more income. Scaling BXW management in Burundi requires strong partnerships with local implementation and policy partners. After intensive training by Bioversity, further field training and implementation are led by RBU2000+ and by the Burundi agricultural extension agency. We are engaging government policy institutions in workshops to achieve the high level policy validation required to scale SDSR nationally. SDSR is a wholly new approach for managing BXW, and for good scaling results all stakeholders need to recognize, understand and accept a number of new ‘truths’. For example, that BXW cannot be eradicated, and that excellent results are possible for farmers who practice SDSR even if their neighbours do not. These messages will be conveyed through continual stakeholder engagement and reflexive questioning to promote learning. Disseminated materials, such as the SDSR trainer-of-trainers guide, also describe and explain these aspects in detail. By scaling SDSR policy and practice in Burundi, this workstream directly contributes to innovation use for improved livelihoods.